The thing I love most about Reiki is that it is so simple. It is the practice of accessing universal life force energy and is completely free of dogma and doctrine. It supports any and all spiritual paths or simply paths of healing and growth. Reiki is a healing energy technique that is facilitated by light touch as the Reiki practitioner serves as a channel to access universal life force energy. This supports our own intelligence and well-being, strengthens our innate healing abilities and restores balance on all levels; physical, mental, emotional and spiritual. The benefits that Reiki offers are the same benefits as removing the effects of stress from your body and life. So, how do you learn this practice? Reiki Level 1 empowers you to self-heal by forming a relationship with the life force energy flowing through you, along with learning techniques to access this energy for yourself and others. In Reiki Level 1 you learn the history and philosophy of Reiki. The focus is on self-practice and you learn how to build and sustain a self-treatment practice that will improve all levels of your health. In this training you receive the Reiki Level 1 attunements*. Reiki Level 2 expands your Reiki practice and enables you to offer Reiki to people who are physically out of reach, to practice Reiki for specific challenges in your life and to deepen your self-inquiry and intuition. There is more focus on using the practice on others but still a strong emphasis on strengthening your self-practice and embodying the principles learned in Reiki Level 1. You learn the Reiki symbols and their uses and receive the Reiki Level 2 attunement. Reiki Master Teacher Training in offered in an apprentice/internship format and included 100 hours of apprenticeship where I completed my Reiki Master training at Mosaic in San Diego. 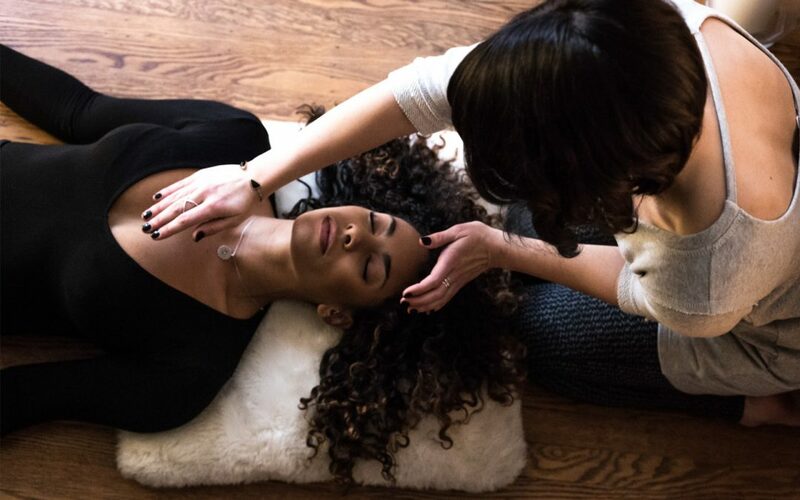 In Reiki Master training you gain experience in many areas — self practice, practice on others, and teaching — as a foundation for guiding others to develop their own practice. After completing an apprenticeship, you learn how to initiate others into Reiki Level 1 and 2 and receive the Reiki Master attunement. *Reiki Attunement is the process by which a person receives the ability to give Reiki treatments. The attunement is administered by the Reiki Master during the Reiki class. The attunement energies make adjustments in the student’s energy pathways and connect the student to the source of Reiki allowing healing pulsations to activate in the student’s hands. If you are interested in learning more about empowered self-healing check out my Reiki Level 1 Training and Self-Healing Workshop. This two-day intensive workshop will give you the tools you need to take healing into your own hands, restoring energy and hope to any healing journey.